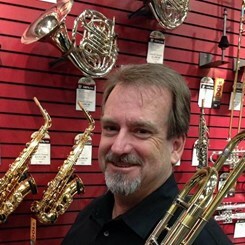 Randy is a former band director who landed with Music and Arts in 2008. He lives in Hitchcock, TX with his lovely wife Lisa and their dogs. He also teaches private trombone and trumpet lessons at a local school and plays trombone with a local Community Band. "A true musician can't NOT play music! Find or form a local community band and enjoy yourself! You will meet and play with like-minded people and make incredible friends."